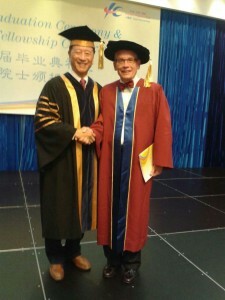 UIC President Prof. Ng Ching-Fai shakes hands with Augsburg College President Paul C. Pribbenow at UIC’s commencement ceremonies and following conferring an honorary fellowship on Pribbenow. Augsburg College President Paul C. Pribbenow was conferred an honorary fellowship at the 7th graduation ceremony of United International College in Zhuhai, China. Augsburg and several other members of the Minnesota Private College Council have been partners with UIC since its founding 10 years ago as the first liberal arts college in mainland China.